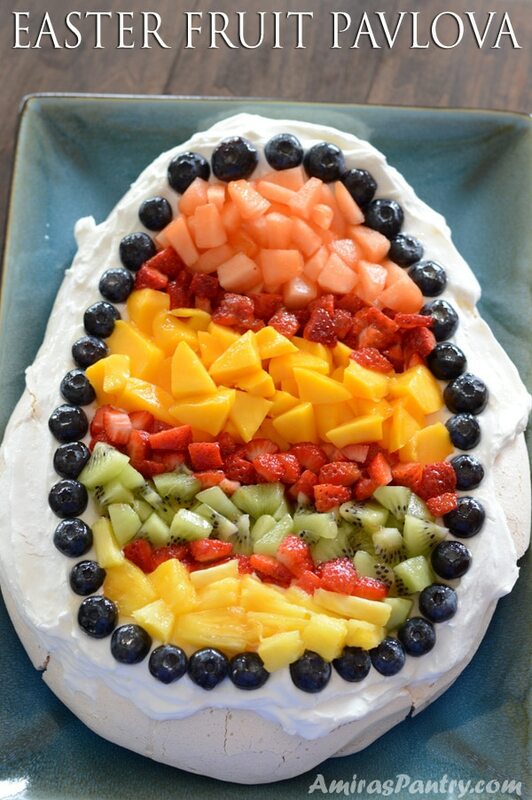 An Easter-themed pavlova, perfectly crunchy on the outside with an inch of marshmallow fluff on the inside. 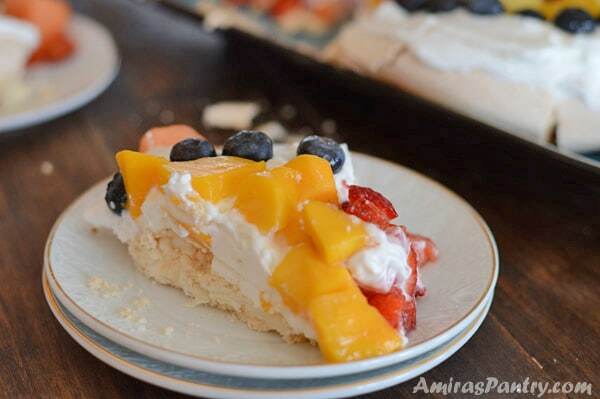 Pavlova is the one of the best low fat vehicles for fresh fruits with whipped cream. 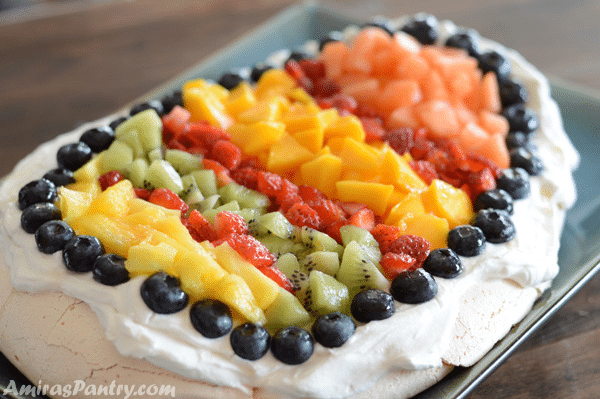 Pavlova is one of my favorite desserts and I have always wanted to try making it. 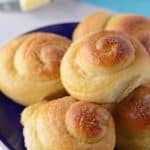 I have always been a bit scared of the process, but it turned out that it is really easy to make and above all delicious. From the name I thought Pavlova was a Russian dessert, forgive my ignorance. 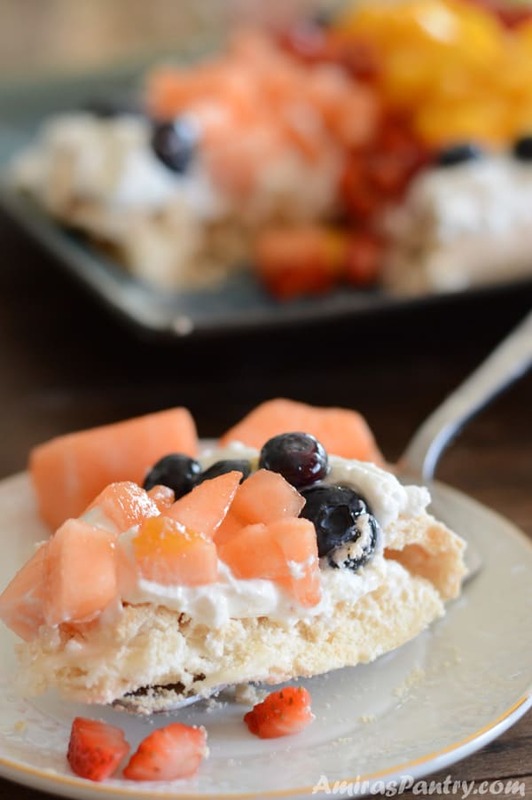 Pavlova is actually an Australian dessert that was named to honor the late Russian ballerina Anna Pavlova. In Egypt, Easter Sunday is always followed by a special festival on Monday. 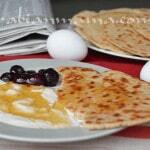 It is called ” Shamm Annaseem” which is considered the Spring celebration since almost 5000 years ago. It is a celebration to welcome Spring which meant new life and new beginnings. This day is celebrated by all Egyptians regardless of their religion. This day is usually filled with activities, getting together with family and friends and sometimes include little trips. For many people also they would like to visit the ZOO!!! yes you read that right I do not know why the zoo is so popular in Egypt at that time of the year. Maybe because outside the zoo, you can find many street sellers, who sell colored eggs, simit and salted fish. We start that day by having a festive breakfast when all the kids gather to color eggs. I remember my mom helping us back in the old days naturally color our eggs. We used red onion peel, yellow onion peel and beets as well. It is said that the ancient Egyptians used to draw on the eggs, things like prayers and what they wished for for the coming season. They used to do so at night and hang baskets full of eggs outside their homes. When the morning comes, the sun rays hit those eggs giving them blessings and making these wishes come true. We also like eating a special salted and fermented fish. I used to hate the smell of that fish and still do. I cannot even bring myself to eat it but many many eat this kind of fish that day. I stick to eating salted and smoked Herring fish. With some lemon, tahini, green onions and pita bread it is so delicious. Did I mention that green onions are also one of the traditional things to eat that day?. But that’s another story and a long one too. I guess you want to start the recipe by now so let’s dive in. First: you’ll need a printout for a large egg. 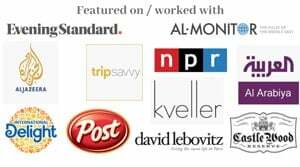 Google free printouts or search on pinterest there are dozens there. Also you can make individual small eggs base instead of a big one. Line your baking sheet with parchment paper and trace the egg. Mix in sugar one tablespoon at a time until stiff peak forms. Finish it off by folding in a mixture of cornstarch, vanilla and vinegar. With the whisk still having some of the pavlova mixture, touch the baking sheet in 4 corners then place the parchment paper drawing side down. These 4 dots will keep the parchment paper from sliding while you work. Spoon mixture inside the egg drawing and smooth it as much as you can. Bake as directed. Prepare the whipping cream and fruits while you wait for it to cool down in the oven. 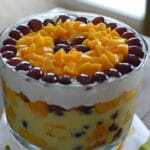 Complete right before serving by adding the whipping cream and arranging the fruits in a beautiful pattern. Do not use fresh eggs from the fridge. Do not open the oven while it is baking. Let it cool in the oven overnight. Add just a tablespoon of powdered sugar and a teaspoon of vanilla to the heavy cream recipe to balance out the sweetness. A fun and easy dessert to welcome spring. Make this with kids for a fun and delicious project. If you like the recipe please give it a 5 star rating! 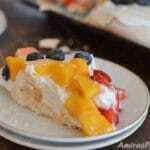 An easy and delicious pavlova recipe shaped like an egg and loaded with fruits. 4 egg whites about 2/3 cup, ROOM TEMPERATURE. Less than a pint of blueberries. Preheat your oven to 275F. Line a baking sheet with parchment paper. 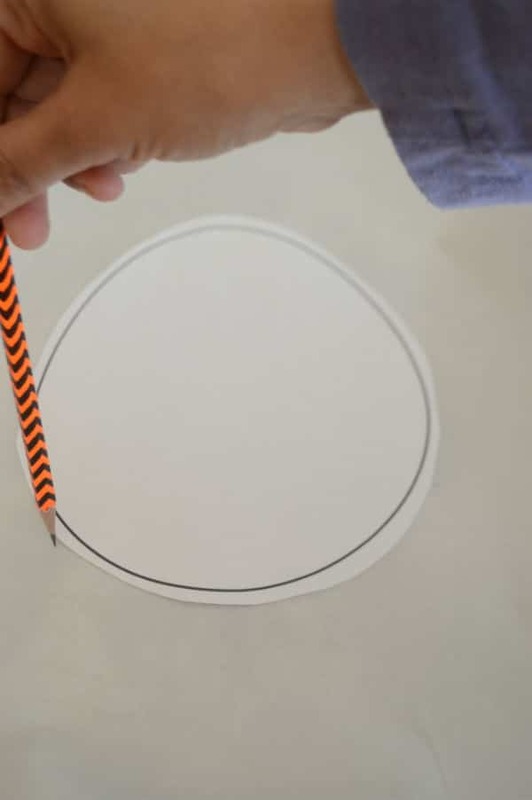 Take your egg printout, cut it and trace it over the parchment paper. 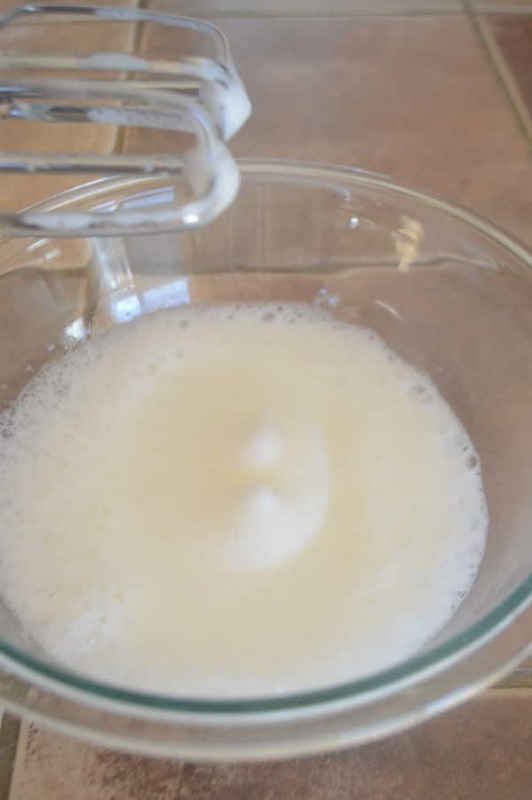 Using a clean mixing bowl with clean whisks attached, beat the egg whites until frothy. Gradually mix in the sugar, this should be done one tablespoon at a time. 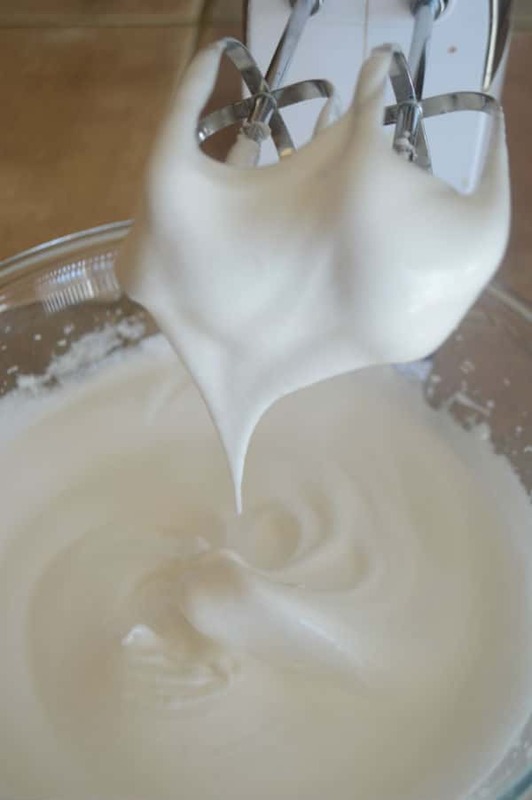 Continue mixing until a stiff peak forms. In a small bowl, combine cornstarch, vinegar and vanilla extract then fold them into the mixture using a spatula. 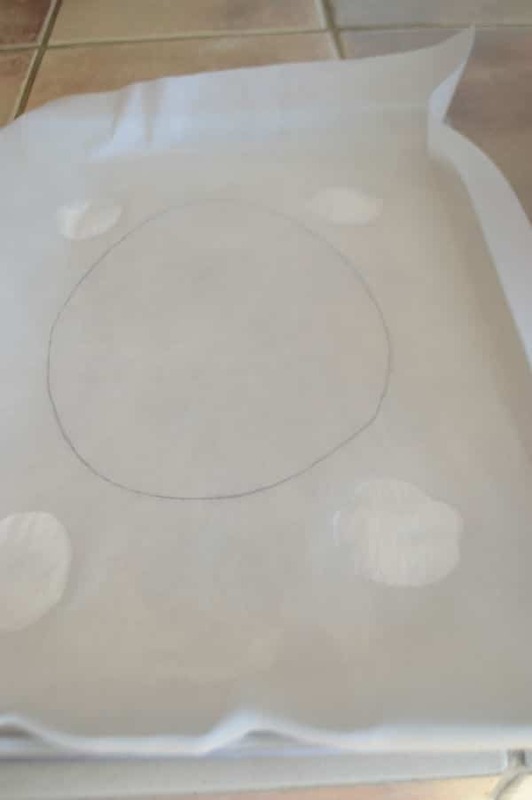 Using your whisk with a little egg white mixture on it, touch your oven pan in 4 corners then place the parchment paper so that the drawing is facing down. Spoon mixture inside the egg drawing and smooth it as much as you can. Try to make the sides slightly higher. Reduce heat to 250 and Bake for 50 minutes, turn off the heat and let it completely cool in the oven for almost 2-3 hours preferably overnight. Meanwhile, make the whipping cream. Arrange fruits in a delightful pattern as you like. 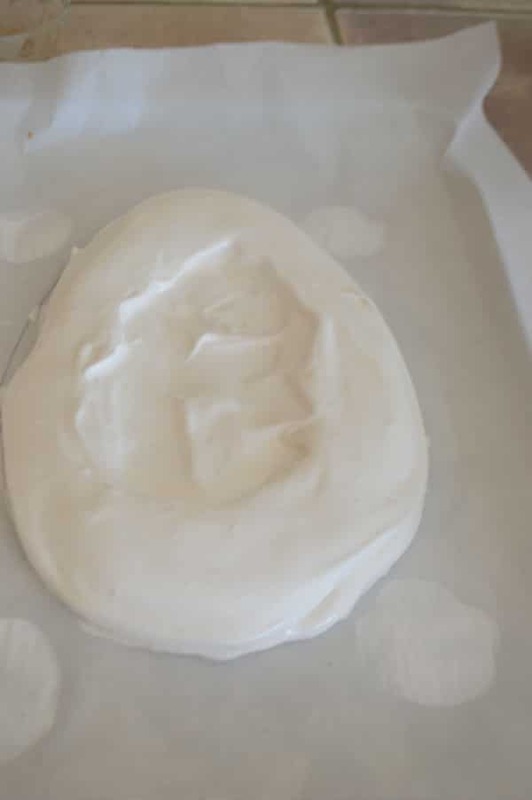 * My pavlova did not stick to the parchment paper, if this is a concern you might want to crumple the parchment paper, then flatten it again over the pan and dust it with some cornstarch before spooning the mixture into the pan.